QUEBEC– Almost a thousand came out Saturday afternoon to protest against the G7 Summit by the National Assembly in Quebec City. But with multiple protests declared illegal yesterday, many are sounding the alarm over police repression. “Democracy must take risks,” said Amir Khadir of Québec Solidaire. 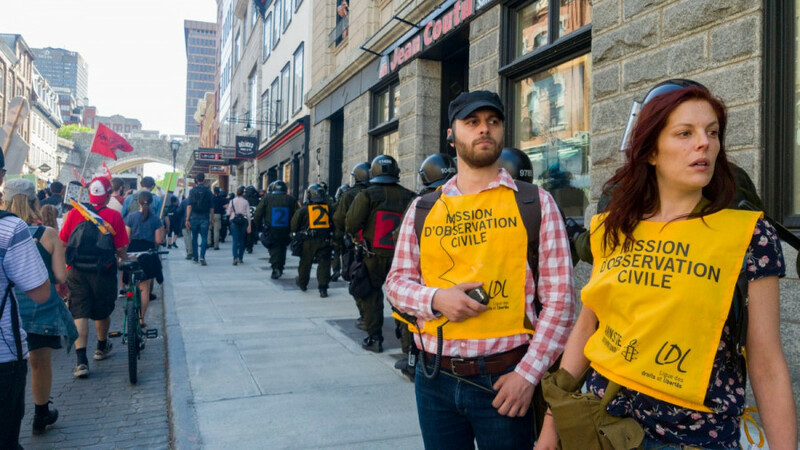 Quebec City police said that over three days of anti-G7 protests 13 were arrested, mainly for taking part in protests already declared illegal. Amnesty International observers on site reported “unacceptable behaviour by police towards protesters and media,” that included sudden and violent arrests and random, unwarranted searches. The Ligue des droits et libertés added that they observed several dangerous acts, that included blunt impact projectiles being pointed at innocuous protesters, and unwarranted confinements of protesters and media. “We deplore this practice which, in limiting movement without apparent motive, breaches the right to protest,” they said in a statement. They also added that they received reports of the police threatening journalists. “We stress the importance of the freedom of the press in a democratic society,” they wrote. Khadir said that he’s disappointed so many people let themselves be intimidated by police and chose not to come out. “It is excessively dangerous to play with [the right to free speech] with a lack of concern, and to have such a large deployment and tell people ‘sure you have the right to protest but don’t actually come, because you will get your eye ripped out or your leg broken by our police force,’” Khadir said. The crowd was represented by labour unions like the the Confédération des syndicats nationaux, Fonds de solidarité FTQ, the Industrial Workers of the World and various activist groups. After leaving the National Assembly, the crowd circled through old Quebec until they returned to their starting point. Protesters remained peaceful and many brought their children. Police wore gas masks while monitoring the crowd and had their batons and blunt impact projectiles on display. Tourists and locals watched on from the sidelines of restaurant patios. Unions who organized the protest criticized the government for spending too much money the summit while funding for social services are lacking. The federal government spent just over $600 million on the summit. Protesters also criticized Emmanuel Macron’s presence at the summit, since his labour reforms will make it easier for employers to fire their employees. The reforms also reduced the power of national collective bargaining. “The G7 is an organization built upon imperialism and the articulation of neoliberalism,” said Kevin Ouellet of IWW Quebec. “It affects our social conditions. G7 leaders don’t have the rights of workers in mind–instead they are putting effort into repressing workers’ right to protest with mass security on the ground. Our government doesn’t speak for us anymore,” he continued. Claude Vaillancourt from the Coalition pour un forum alternatif au G7 said the high police presence hindered protesters’ right to free speech. One protester told The Link he didn’t come out to other protests over the last two days out of fear of being arrested or hurt. 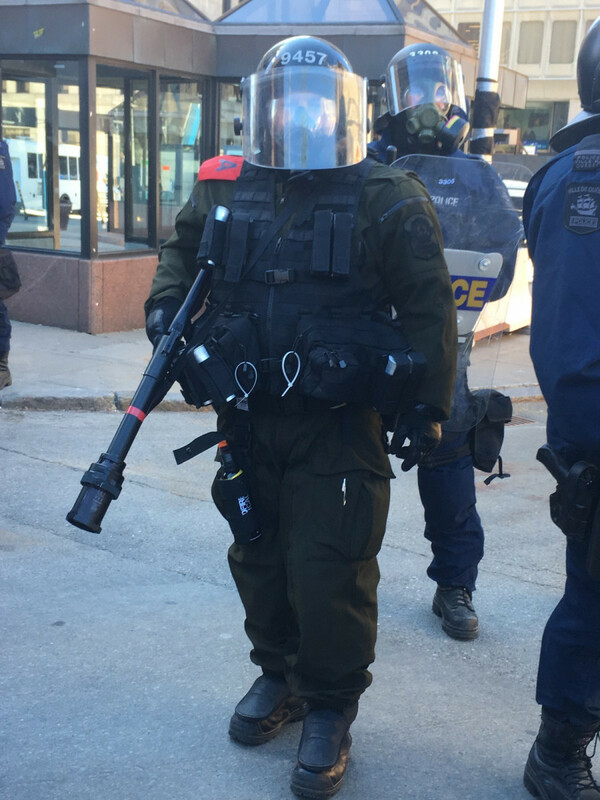 “It’s an intimidation tactic that sends a message that people should stay home instead of going into the streets to defend their values,” said Villantcourt. “They’re hiding behind closed doors while claiming a certain legitimacy but we’re saying [the summit] is completely undemocratic in practice,” said Dominique Daigneault of the Conseil central du Montréal métropolitain, which is part of the CSN.